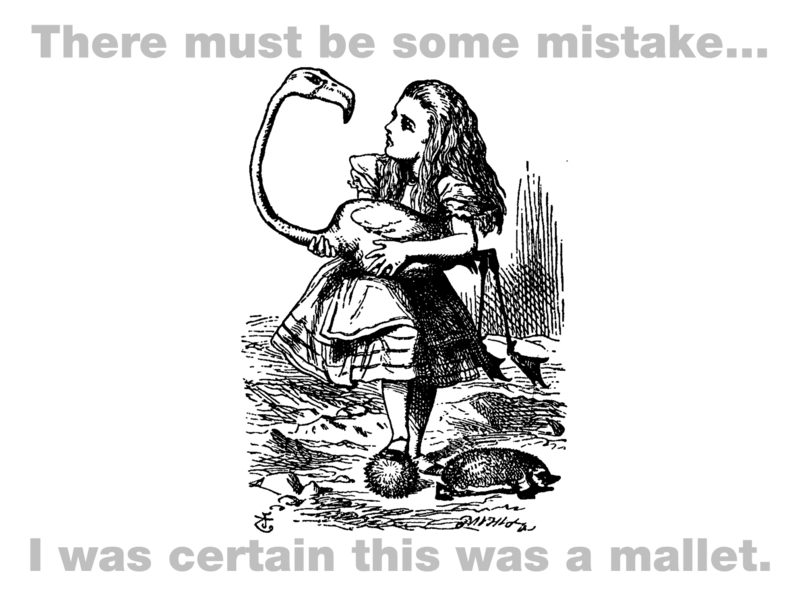 In this and several other posts, we address a corollary to Lewis Carroll’s famous riddle. In our case: “Why isn’t Presumptive Design like ?” In this post we tackle the comparison between Presumptive Design and Design Thinking. See these posts for other comparisons. Since the book was published we’ve had several conversations in which PrD was characterized as “just another version of Design Thinking.” Technically, PrD is a research method, while Design Thinking (DT) is a theoretical framework, so the comparison seems ill-fated from the start. Still, given PrD’s reliance on DT, we use this post to clarify the relationship between the two. We dedicate the entirety of Chapter 2 in the book to how PrD fits within various DT frameworks. PrD is based firmly on the design thinking notions of sketching, critiquing, and most importantly, iterating between the two. We’ve used the Owen/Kumar/Sato model out of ID-IIT to illustrate the nuances of the iteration, the real-world vs. symbolic representation, analysis vs. synthesis and the finding vs. making dualities that are common to all conversations about design thinking. 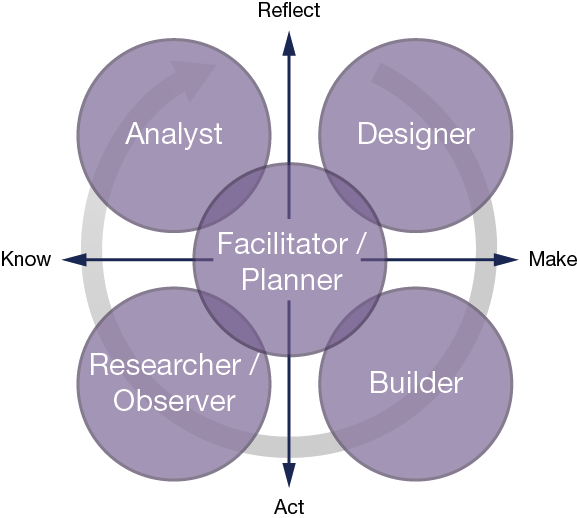 In Chapter 10 we apply that framework to identify the different roles team members play in the PrD process. DT, in brief, is the fabric of the PrD method. But that is very different from suggesting PrD is just another representation of DT. DT in and of itself is not an actionable method: it is a theoretical framework for illustrating how we think as we design. DT is not an operational process; PrD is. The key contribution PrD makes is to take Vijay Kumar at his word: while his diagram (and Sato’s later derivative of it) suggest a simple step-wise progression from hypothesis through discovery ultimately to a solution, Kumar has said the process can begin in any quadrant and proceed in a haphazard fashion – more of a squiggle than a loop. We choose to consciously begin in the upper right quadrant for one major reason: in many instances our clients have already made up their mind about the problem, in many cases even sketching out a solution. As consultants (or newcomers to an internal team) we don’t often know the market or the product “space.” Our beginner’s minds may be perceived as an asset (by broad minded clients). But more often, our lack of experience is seen as a liability – a time and money sink until we’re ramped up to speed. By starting in the upper right quadrant, we don’t need to argue with our clients about their putative solutions, or even their interpretation of their current problem space. Not only can we accept it at face value, we can use the Creation Session to help them introduce us to their operating assumptions. What better way to ramp us up? 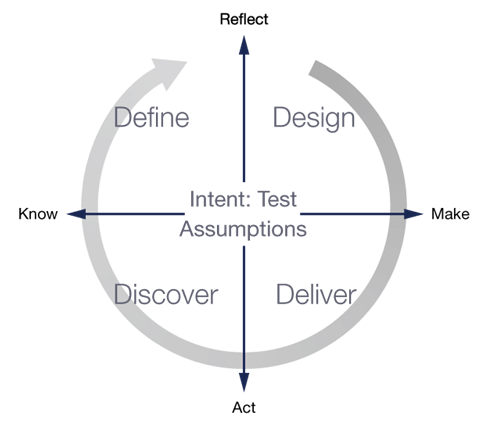 We optimize the process further: during the Creation Session, our stakeholders craft the artifact that embodies those assumptions, an artifact we can immediately use in the subsequent Engagement Sessions. We don’t express concerns about our client’s premature solution; we accept it. Who knows? In spite of years of experience building products and designing experiences, we have no experience with this client; we could be wrong. Then, when we ultimately do get in front of customers, we leave it up to them to help all of us understand the relevance and “fit” of the proposed notions. Is PrD just another rendition of a DT model? No. 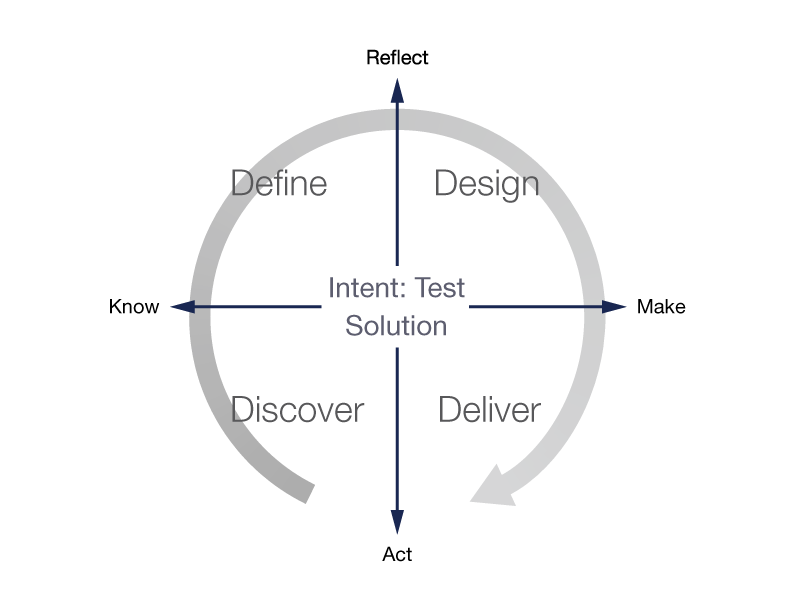 It is an expression of a particular DT model, applied to rapidly identify a valuable problem for our clients to solve. Contact us to learn how Presumptive Design applies Design Thinking to your research, or buy the book!